Welcome to Gold Rush Results 30hr 2016. 'Columbia Vidaraid powered by Pasokin' wins theGold Rush 30 Hour Challenge and NAARS Championship event. The 30 Hour Challenge and NAARS Championships finished at 1:30pm Sunday September 18th. 6th Altitude Junkies. 19 points. 28hr 33min. 9th Team Lucky 16 points. 29hr 30min. 14th Peak Happiness. 22 points. 31hr 12min. Finished over 31 hr cutoff. 16th Porkys Revenge. Finished Incomplete. Reached Cp 8 complete. 17th LPF. DNF Cp10.. Reached Cp 8 complete. 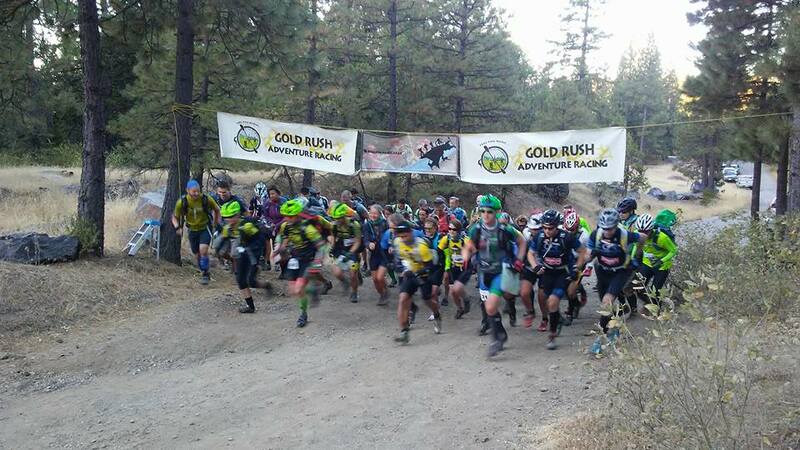 Gold Rush 30 hour 2016 Detailed Results. The registration location and host hotel will be the Long Barn Lodge in Long Barn California on Highway 108. This beautiful location will host the check in and registration on Friday afternoon and evening and the pre race meal and briefing. See below for details. On Eventbrite choose the team option. Your first sign up has to create a team and may have to log on to Eventbrite to do that. Subsequent members can select the team and sign up. Four and Three person teams. Hiking, Orienteering, mountain biking and paddling. Boats included in the entry fee. Course designed to be a challenge for the top teams but with options designed to let all teams have a chance at finishing. No crews. We provide the boats. Big ropes section. Great facilities near the hosting town to keep friends and family entertained while you race. Or send them to us as volunteers! Please have one of your team call the lodge at (209)-586-3533 or in the evenings (209) 586-5859 to reserve lodging. Identify yourself as being with Gold Rush. We recommend that you stay Friday night at the minimum and you may wish to stay one or more nights prior to or after the event if your schedule allows it. Of course additional nights for your families or friends may be booked too. We have hotel rooms at the race HQ held for you. Prices range from $109 per night for rooms to $169 for cabins. As of now we have plenty of rooms and entered teams will have plenty of opportunity to book these rooms. Motels and camping are are also available near the registration location but are not so convienient for checkin or the start. See the FAQ's below. The lodge is willing to accept shipments prior to the event. See the FAQ's for details. Get your entries in and we look forward to seeing you racing on a classic expedition style course. The event is located on and under Special Use Permit from the Stanislaus National Forest. Friday evening: Race Briefing 7pm. Sunday: Post race barbecue and awards 3pm.